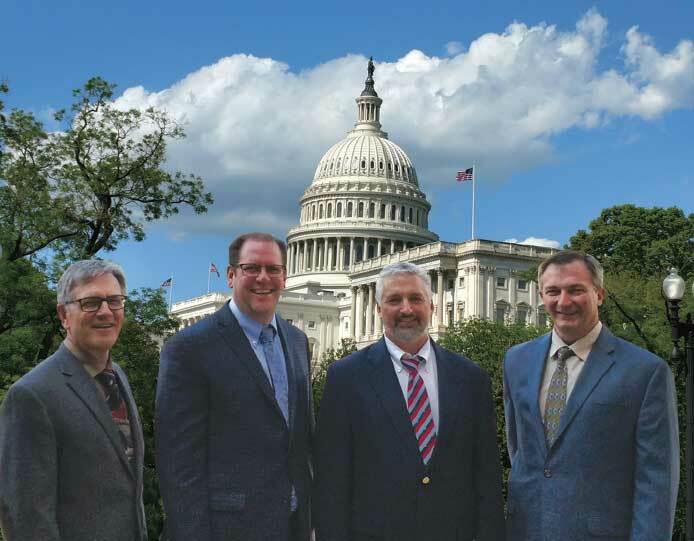 The AASV Executive Committee, Drs Scanlon Daniels, Nate Winkelman, Jeff Harker, and Alex Ramirez, joined Dr Harry Snelson, AASV Director of Communications, May 7 and 8 in Washington, DC. The group joined the American Association of Bovine Practitioners’ leadership for an annual visit hosted at the American Veterinary Medical Association Government Relations Division headquarters. The purpose of the trip was to provide AASV leadership an opportunity to interact with federal regulators, government agency personnel, legislators, and swine researchers to discuss issues of concern to swine veterinarians. In addition, the Executive Committee heard from the American Feed Industry Association (AFIA), National Cattleman’s Beef Association (NCBA), Association of American Veterinary Medical Colleges (AAVMC) and representatives from the National Pork Producers Council (NPPC). Drs Steve Solomon, Director for the Food and Drug Administration (FDA) Center for Veterinary Medicine, and Bill Flynn, Deputy Director for Science Policy, represented the FDA. The agency is beginning to transition from educational veterinary feed directive (VFD) inspections to regulatory enforcement. To date, few problems have been identified and adoption of the revised VFD rule has been largely uneventful. The agency plans to issue an updated Guidance for Industry #120 revising the Frequently Asked Questions resource to include additional questions and responses. The FDA’s overall goal with the revised VFD rule and targeted guidance has been to support antimicrobial stewardship and veterinary oversight. Drs Flynn and Solomon addressed the issue of establishing duration of use for drugs for when it is undefined on the product label. This effort is in the early stages with the agency as they try to understand the scope of the issue. Many of these products were initially labeled for over-the-counter (OTC) use and are now under veterinary oversight. The agency’s intent is to retain the use of the products but to bring the labels in line with the goals of veterinary oversight. They plan to release an overarching plan in the next few months outlining what needs to be addressed and a timeline. Transition of OTC products to prescription status and addressing the duration of use issue are the two primary topics to be considered in the plan. The group also discussed the need to better understand FDA’s role in protecting animal agriculture from imported ingredients that could be harboring pathogenic organisms. FDA noted that the Food Safety Modernization Act will require importers to analyze products for specific hazards if a real risk can be determined. Currently, the agency concurs that there appears to be a theoretical risk, but the real-world significance has not been established. According to Dr Solomon, FDA has regulatory authority over all feed ingredients intended for use in animal feeds, but the United States Department of Agriculture (USDA) would probably provide the data to establish the risk. When asked about the agency’s position on the regulation of gene editing in animals, Dr Solomon indicated that the agency was looking for a flexible risk-based approach to allow for production animal use. He indicated that the agency recognizes gene editing is not the same as a new animal drug but believes the practice should be regulated to ensure it is safe for the animal, public, and environment. They plan to issue a final guidance highlighting FDA’s direction later this year. In an update regarding the status of carbadox, the agency continues to review the studies provided and has requested additional information. While the review process continues, it remains legal to market and use carbadox as labeled. The Executive Committee talked extensively with Richard Sellers, AFIA’s Senior VP, about feed-related concerns such as imported ingredients and disease transmission risks via feed-associated sources as well as the feed industry’s perspective of the recent VFD changes. Sellers indicated that the VFD transition had gone relatively smoothly for the swine industry and approximately 70% of the VFDs are submitted electronically. This year’s visit also included discussions with NCBA’s Drs Kathy Simmons, Chief Veterinarian, and Jessica Watson, Manager Animal Health Policy. Antibiotic use is a key issue facing NCBA including monitoring on-farm antibiotic use to address resistance issues, maintaining therapeutic antibiotics for prevention, control, and treatment of disease, and the pending review of Guidance for Industry #152 which categorizes antibiotic status relative to human health uses. Other pertinent issues include preparation for foreign animal disease response and efforts to promote an industry-driven voluntary animal identification program. Representatives from the AAVMC met with the group to discuss several programs designed to address issues of diversity and student debt. They discussed the REAL program designed to explore research, education, advocacy, and longevity issues and the fact that in 2017 approximately 80% of graduates have veterinary student debt. Dr Bruce Wagner, Director USDA Center for Epidemiology and Animal Health, joined the meeting by conference call. He described the Center’s plans to address antimicrobial resistance by evaluating antimicrobial stewardship and use surveys distributed in 2017. The department was disappointed in the low response rate. It was suggested that the department work closely with the livestock industries and veterinary groups to encourage greater participation in future survey efforts. The proposed longitudinal studies assessing on-farm antimicrobial use were being delayed due to concerns regarding the ability to protect the confidentiality of the biological sample data. He will work with the livestock industries to determine how to proceed. Dr Dan Kovich, NPPC Director of Science and Technology, discussed a number of issues of importance to swine producers and veterinarians including the Farm Bill (support for funding for a foot-and-mouth disease [FMD] vaccine bank and the Secretary’s decision to allow non-infectious vaccine virus on the US mainland), trade (27% of US pork is exported; China, Canada, Mexico, and Korea make up about 60% of US pork exports), immigration reform, gene editing regulation, swine slaughter modernization, the development of alternative meats, and a recent San Francisco ordinance requiring reporting of on-farm antibiotic use. On Tuesday, the AASV Executive Committee visited the National Institutes for Food and Agriculture (NIFA) headquarters to meet with NIFA and Agriculture Research Service (ARS) swine researchers. The group discussed federal funding for swine research and the swine-related projects ongoing at NIFA and ARS. The group traveled to Capitol Hill to meet with legislators on behalf of NPPC to educate lawmakers on the need for the FMD vaccine bank, the importance of opening trade with Thailand, and farm worker legislation.